Governor: "Please don't bring your teenager to Nebraska"
OMAHA, Nebraska (CNN) -- Nebraska officials said they're concerned about an apparent rush by parents to drop their teenage children off at hospitals before lawmakers change the state's troubled "safe haven" law. Four children have been dropped off at Nebraska hospitals in the last two days. The latest cases came the day before the state Legislature kicked off a special session to add an age limit to the law. On Thursday, a boy, 14, and his 17-year-old sister were dropped off at an Omaha hospital; the girl ran away from the hospital, officials said. 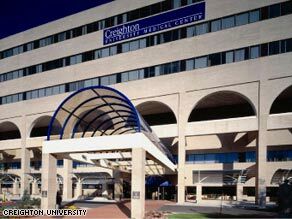 A 5-year-old boy was left by his mother at a different hospital, officials said. The day before, a father flew in from Miami, Florida, to leave his teenage son at a hospital, officials said. Nebraska's safe haven law was intended to allow parents to hand over an infant anonymously to a hospital without being prosecuted. Of the 34 children who have been dropped off at hospitals, officials said, not one has been an infant. All but six have been older than 10, according to a Nebraska Department of Health and Human Services analysis. State officials said that because of legislative procedures, it will take at least a week to change the language of the safe haven law, creating a window where more parents could try to take advantage of the loophole in the statute. "We are ready and prepared that that situation occurs," said Todd Landry of the Nebraska Department of Health and Human Services. "We want people to understand that this is not the right way of getting the service for your child, your teenager or your family." State Sen. Tom White said lawmakers have been caught off-guard by the number of teenagers taken in under the law. "What you've seen is an extraordinary cry for help from people all across the country," White said. "Nebraska can't afford to take care of all of them. Nebraska would like to be able to, but they know that we can't, so we are going to have to change the law." There's growing support among many Nebraska lawmakers to limit the safe haven law to children no older than 3 days. But several lawmakers said they'll push for something closer to a 30-day age limit. The safe haven law was meant to protect infants, but there is no age limit under the current law. Five of the abandoned children were brought to Nebraska from out of state. Parents have traveled into Nebraska from Michigan, Indiana, Iowa, Florida and Georgia. Tysheema Brown drove from Georgia to leave her teenage son at an Omaha hospital. "Do not judge me as a parent. I love my son, and my son knows that," Brown said. "There is just no help. There hasn't been any help." Safe haven laws allow distraught parents, who fear that their children are in imminent danger, to drop them off at hospitals without being charged with abandonment. Nebraska was the last state in the country to pass such a law. But every other state included an age limit. Twenty-seven children have received mental health treatment. 28 children come from single-parent homes. 22 children had a parent with a history of incarceration. 20 of the 30 children are white; eight are black. There are 6,600 children in state custody, according to the Department of Health and Human Services. Per capita, the figure is one of the highest rates in the country, Landry said. "I think this has spurred some really healthy conversations about how do parents get the help that they need when they are struggling with some of these parenting issues," he said. "And the message that we have been trying to get out is, 'Don't wait until it's a crisis. Reach out to your family and friends.' "